Every so often, I like to talk about my son Graham. He has some special needs which I have written about here, and again here, and finally here. Our very first venture into getting help for him started with his first speech assessment at about 22 months old. Our pediatrician recommended a certain clinic and, because she had never steered us wrong, I took him there without hesitation. We did not have a good experience and as I contemplated weekly visits for him, I knew we needed another option. A friend told me about a place that helped children from birth through age 3, an amazing place called The Boyer Children’s Clinic. I knew it sounded familiar and when I told my mom about it, she reminded me that she had brought my brother there over 30 years ago. Dim memories of reading in a waiting room while eating a snack came back to me. From the moment we stepped through the door at Boyer and continuing on to this day, our experience with those amazing people has been nothing short of incredible. We started off just doing speech therapy but gradually joined in the preschool program that serves both typically developing and special needs children. One day not long after we started, we rode up in the elevator with a little girl and her nanny. The little girl was in Graham’s class and I had noticed how loving and sweet her nanny was with her. I asked how long she had been working for the family and was surprised to hear that she was just filling in temporarily. Because I had next to no childcare at that point with a toddler and a baby, I pounced. Was she looking for more hours? Yes, she was and that is how we got Erika, the most amazing babysitter on the planet. Now that we have been working together for 2½ years, I can tell you that she is really just an amazing woman. Babysitter is not the right term for her. She has spent eight hours a week with my boys for all this time and their lives are richer because of it. She is helpful to me in a million ways (she loves to fold laundry! she is much neater than I am!) but the bottom line is that she adores my children and they adore her right back. They do Dance Party USA in our basement, she takes them on walks to see the ducks and get doughnuts, she solves their squabbles kindly and firmly. She has also introduced us to Jenna, Catherine, Steena, and Autumn – all lovely young women who have watched the boys on numerous occasions. Erika is a treasure. I am thankful to Boyer for all they have done for Graham, but I might just be most thankful to them for giving us Erika. Graham left Boyer just after his third birthday (as all their children do) but we have stayed involved with them. We go to their auction every year and, just recently, Randy was elected to their board. They had a fundraiser last night and, when Randy told them that I cater occasionally, they asked me to do the food. This party has been in the works for weeks as I planned the menu, got the shopping done, and cooked as far advance as I could. The day before and day of were a little hectic, but I was so happy to be cooking for a place I believe in so deeply. Early last week, I glanced at my calendar – my real one where the birthdays are written down in my handwriting, not my iPhone – and realized that today, Saturday, is Erika’s birthday. Friday night I cater an event for Boyer and Saturday is the birthday of one of our favorite people, the woman we never would have met if it weren’t for Boyer. Life is funny sometimes. I took some of the batter I was using for cupcakes and made her a little cake. I would have taken a photo along with the cupcakes but I had a frosting malfunction and therefore wouldn’t recommend the recipe. She and the boys decorated it and she took the rest home. I hope her celebration lasts for the next 24 hours straight. I got my April issue of Food & Wine right around the time I agreed to do the food. The dessert on the last page jumped out at me as something I wanted to make without question. 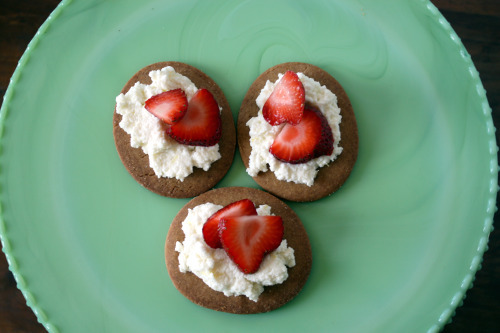 Lovely cookies with just a bit of spice and a lot of crunch topped with sweetened lemon ricotta and strawberries. It is such a nice combination and so pretty for spring. I brought some mint as garnish but a giant slug had taken up residence in the package. Next time. I am always apprehensive about working with cookie dough that needs to be rolled out but I found this dough dreamy to work with. One more note. The party last night was at a place called GlassyBaby. 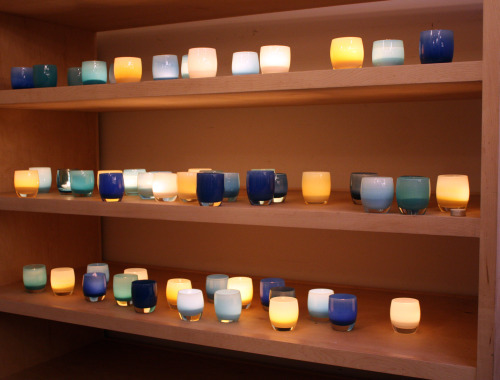 This is a store that sells the most beautiful hand-blown small glass cups, usually used as candle holders. They come in about 70 different colors and make a wonderful gift. They have certain lines where they donate 10% of the proceeds to different charities or non-profits. For the next three months, they will be donating to Boyer as long as you mention them. This is about how many I want. This recipe calls for an oval cookie cutter which I was not able to find. I bought a cheap 3-inch round one and squished it into an oval. 2. Preheat oven to 350ºF. On a lightly floured work surface, roll out the dough 1/8-inch thick. Using a 3-inch oval cookie cutter, stamp out 16 ovals; reroll the dough scraps if necessary. (DT: There is no need to re-chill the dough.) Transfer the ovals to the baking sheets and bake for about 12 minutes, rotating the pans halfway through until lightly golden around the edges. Let cool on the pans for 5 minutes, then transfer the ovals to racks to cool completely. 3. In a bowl, toss the strawberries with the remaining 1/3 cup of sugar and the lemon juice. Let stand until syrupy, about 20 minutes. 4. In a medium bowl, mix the ricotta, confectioners’ sugar, and lemon zest. Spread about 1 tablespoon of the ricotta mixture on each oval. Arrange the strawberries over the ricotta and if there is syrup from the strawberries, drizzle over. Its wonderful to hear about how much you love Boyer. We are huge fans as well! We didn’t make it yesterday, I would have enjoyed meeting you and your family. My little girl is the one on the “Save the Date” flyer we just got for the fall auction. You can just see her little hearing aids. This picture is about three years old, but I still see her pics around on various things. Congratulations to your husband for joining the board. Keep up the wonderful work you both are doing. Blessings. what cute little tartlets! love homemade grahams. in fact, we’re using some tonight for s’mores! It’s so nice to see that places like Boyer exist and I’m so happy that you found this for your son. No doubt it made all of your lives richer and better. It’s also wonderful to hear that you are giving back by sharing some of your talents with the school. These tartlets look amazing. I’ve seen the strawberry/ricotta combo around lately but never as decadently as it is here. As a Boyer employee who attended the glassybaby event and witness to your delicious food creations, I want to thank you for your inspiration. I was inspired enough to make those black bean tostadas you recently posted – definitely a new “top 10″ in my home. I look forward to trying many more of your recipes, and thank you for your support of Boyer! So happy for your great event. It’s the best when what you love to do can bless a recipient/organization you believe in so much! i ripped out this recipe to try!! There’s some good recipes in that current issue huh? Good to know that it’s not daunting with rolling out the cookies- I too tend to stay away from any rolling! I love hearing about your life btw. We are currently looking for a babysitter….and HOPING we score. Sounds like Boyer is a very special place. Glad the event went well. You always amaze me. 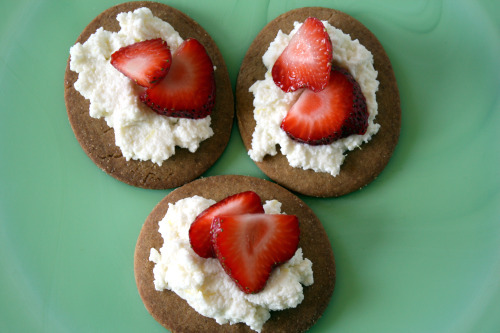 I love strawberries and ricotta together-lovely dessert! I love happy coincidences like that! I was just looking at these tartlets in Food and Wine. The lemon ricotta sounds great. Yours look delicious! Thanks for sharing all of it. Just went back and read your initial posts about Graham. He’s lucky to have such a wonderful and supportive family. Also, the recipe you shared looks delicious and I will probably end up making them some time soon! As I read this post, Erika is reading to Kendall out in the living room while I work (or read Dana Treat) in the office. She is amazing, and you are a dear friend for sharing her with me right now! :) I just love reading your blog! See you in a few hours. I can’t wait! I have tears in my eyes because I have been friends with Erika for 9 years, and she deserves every word of the lovely things you wrote about her. She IS amazing! Thank you for reminding her. Also, your blog makes me hungry! Delicious! I love the look of these cookies! And topped with ricotta and strawberries sounds perfect. I don’t think to use ricotta in sweet ways like this.